Shares of the maker of Pop! toys surged last year, as it forged a number of licensing deals and posted strong growth. Funko (NASDAQ:FNKO), the maker of the popular Pop! figurines, took investors on a wild ride last year. The stock surged through the first eight months of 2018, scoring licensing deals with a number of partners. Shares had even quadrupled at one point. However, the company's fundamentals couldn't sustain the suddenly inflated valuation, and the stock fell during much of the last four months of the year. Still, investors who held through all of 2018 can't complain. Shares finished with a 98% gain, according to data from S&P Global Market Intelligence. Here's a look at the roller-coaster ride the stock went on last year. Funko, which had its IPO in late 2017, was largely under the radar as 2018 began, and it slowly picked up momentum in the first few months of the year. The stock got a boost in January, when the company said it would launch an exclusive collection at Target, sending the stock up 6.4%. After a quiet February, shares jumped another 6% on March 9 on its fourth-quarter earnings report, as Funko showed off accelerating sales growth and expanding profit margins, with revenue increasing 28% to $169.5 million in the quarter. Momentum continued to build after another strong quarterly report in May, showing revenue up 38% and increasing profitability. By the time the summer arrived, the stock was starting to surge, having attracted the attention of traders as trading volume had increased significantly. In July, the stock popped first on news that it would partner with Pokemon, and then just a few days later, it surged on a deal to make Fortnite toys and collectibles, capitalizing on the popular Battle Royale video game from Epic Games. In August, its earnings report got another round of applause from Wall Street as operating income more than doubled, and the stock's gains accelerated until it peaked at $31.05 on Sept. 10, nearly 400% above where it started the year. However, those gains quickly unraveled as momentum shifted, and the stock was then pressured by the market sell-off beginning in April. Finally, the stock tumbled in November, when its third-quarter earnings report showed revenue growth slowing and gross margin falling. Funko has bounced back considerably in 2019. The stock is already up more than 20% through the first two weeks of the year. However, it's difficult to tell at this point if Funko is anything more than a fad, as often happens to popular toys. The stock trades at a reasonable P/E valuation of 32 based on trailing earnings, and profits are expected to continue to improve. 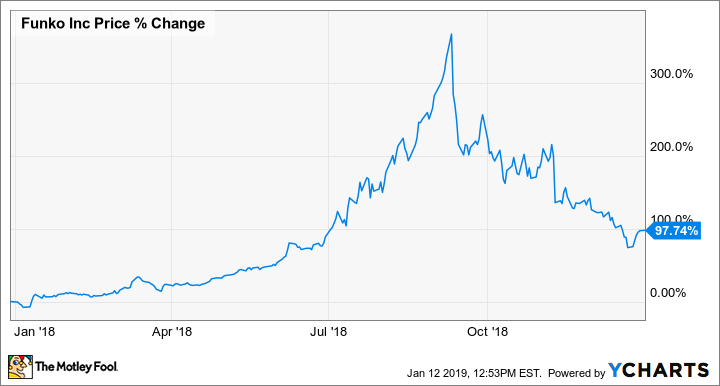 While I wouldn't expect Funko stock to surge another 367% this year, there's a fundamental case for the stock to move higher in 2019. We'll know more when its holiday quarter results come out in March.